This set uses the rudder and elevator servos that appear in the 1953 and 1954 advertisements. Later ads show a different model servo like the one in the picture below. The rudder servo is a self neutralizing type. 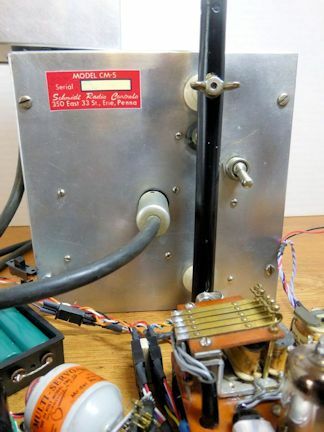 Elevator is trim only, as the elevator relays do not have wire leads to the NC contacts and the receiver's side mounted connectors for the wiring harness do not provide enough pin connections for such leads. Similarly, the motor relay has only leads to the armature and the NO contacts. A deBolt three position servo (model 3P) was used to complete the set..